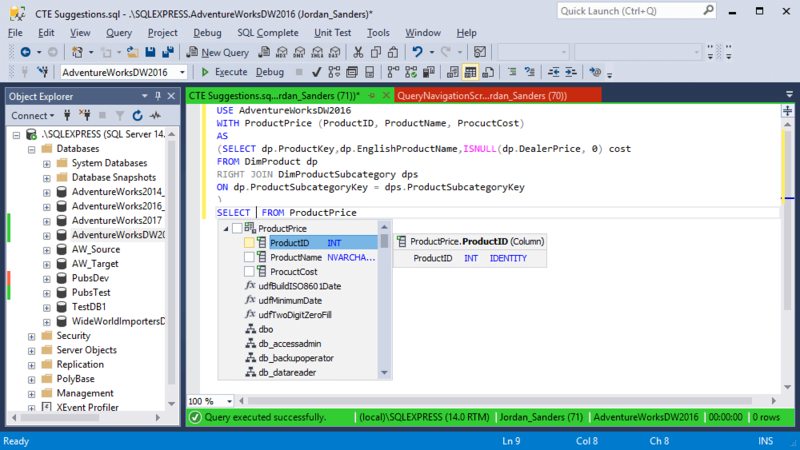 SQL Complete analyzes the context of the code you are typing in the SQL editor and displays the most relevant keywords and even code phrases. As you type the first letters of the object name, SQL Complete prompts a list of available objects and automatically filters them depending on the characters you are typing. Filtering is sensitive to the typed characters, symbols, whitespaces and CamelCase. 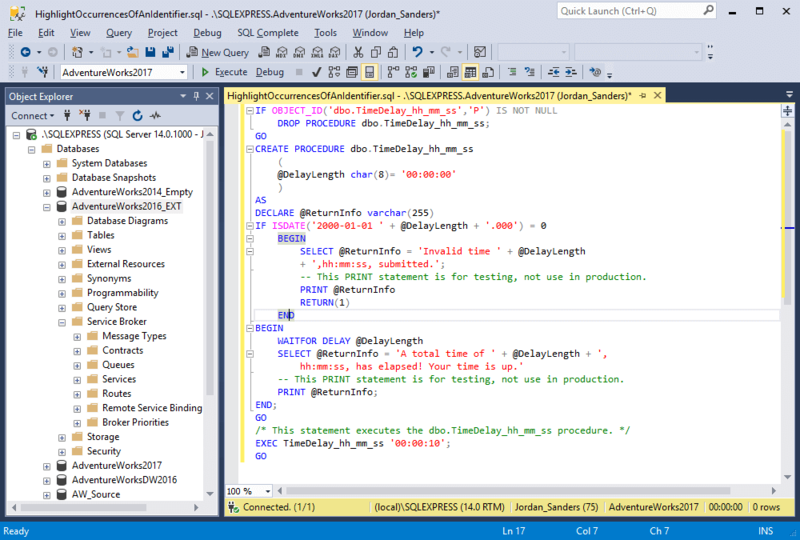 SQL Complete helps you to accelerate your routine code typing with multiple embedded prompts for T-SQL code, DDL, and security statements that may be inserted right when you type the code. 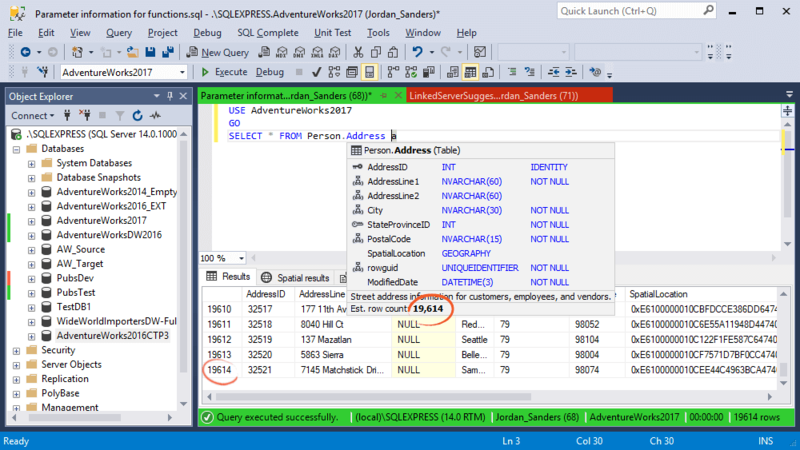 SQL Complete simplifies maintenance of complex queries by suggesting both Common Table Expressions (CTE) and recursive CTE in SELECT, INSERT, UPDATE, DELETE, or CREATE VIEW statements. For the recursive CTE statements, the suggestion list shows scalar functions, columns, and aliases. Scripts executed through the command line are parametrized. A database or schema name can be a variable which makes it impossible to show suggestions for their objects. 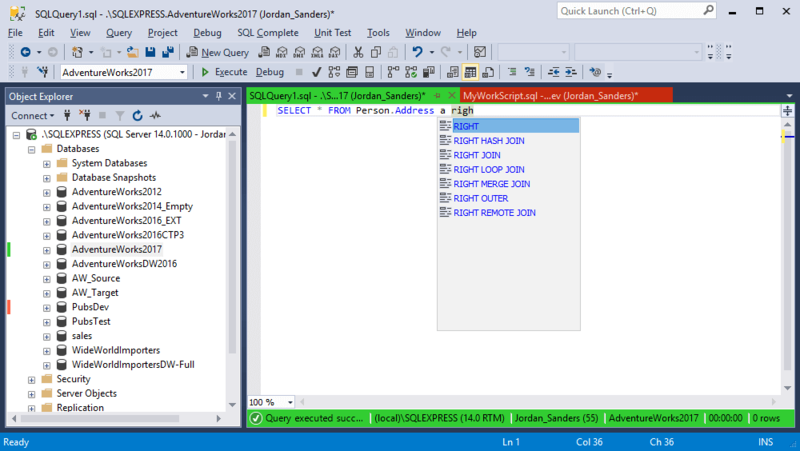 SQL Complete takes the values of variables from the text of the document and suggests objects just as with an ordinary SQL script. 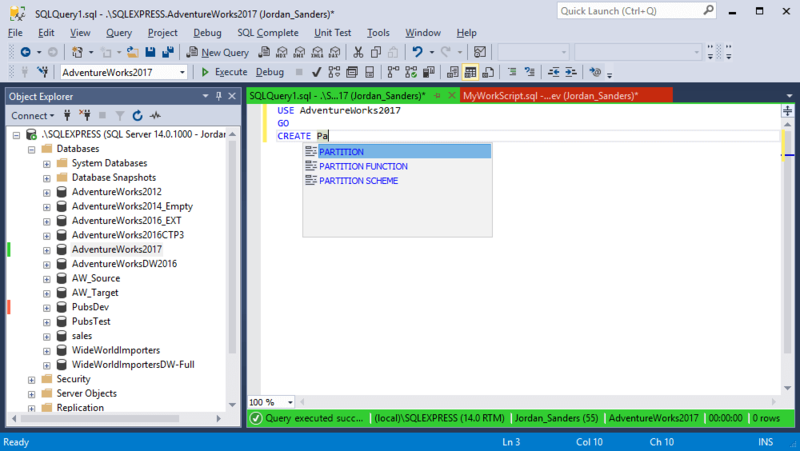 If you are using a linked server configuration when creating queries, SQL Complete prompts all the existing objects for a linked SQL Server. 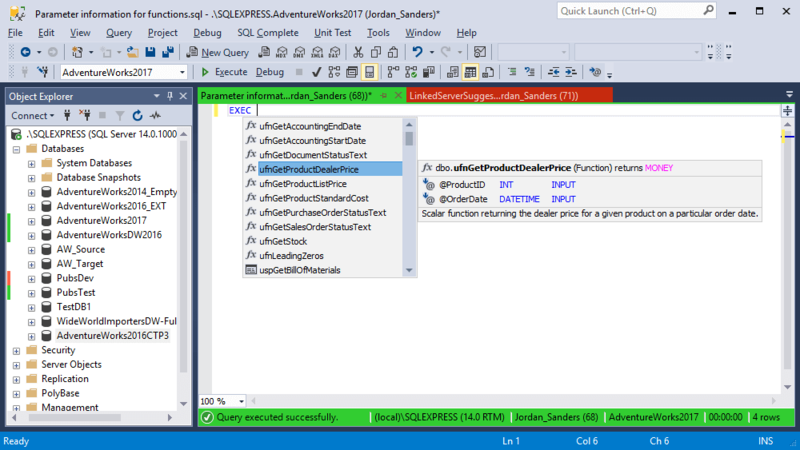 SQL Complete automatically sorts object names and keywords in the prompt list depending on the characters you are typing. Sorting is sensitive to the characters, symbols, whitespaces and CamelCase. 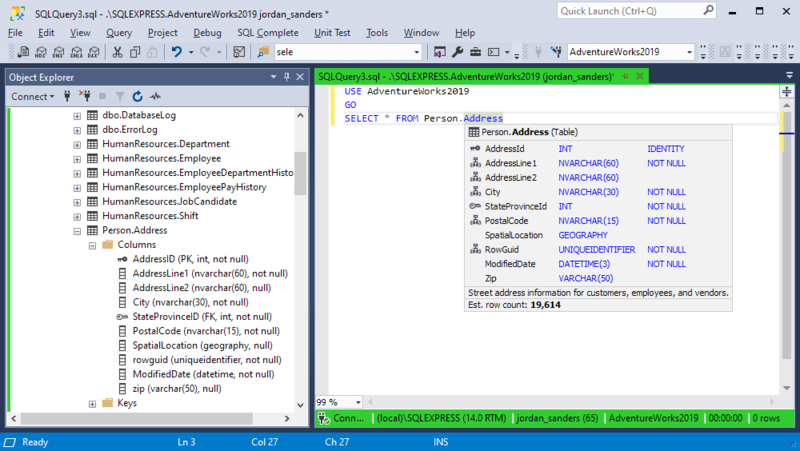 SQL Complete suggests a complete JOIN statement when you combine tables based on foreign keys or it can prompt conditions based on column names. You can select a JOIN statement from the prompt list manually, in case you need a specific JOIN operation. Not just separate keywords and object names are suggested, but entire code phrases, such as OUTER APPLY instead of APPLY, ORDER BY instead of ORDER, etc. The suggestion box may overlap a part of your code. You can quickly may it visible again – hold Ctrl to make the suggestion box semi-transparent. When you write the SELECT...FROM statement, SQL Complete automatically generates aliases for tables, views, table-valued functions, and synonyms, which can be further used to refer to the objects. You can set up custom rules for assigning aliases to table objects. What is more, you can create your own custom aliases and assign them to the objects you constantly use. SQL Complete offers a number of alias masks for mapping custom alias. You can use the alias masks to specify conditions and actions when assigning aliases. When you type a SELECT statement or a similar clause, Column Picker prompts a complete list of relevant tables and columns. 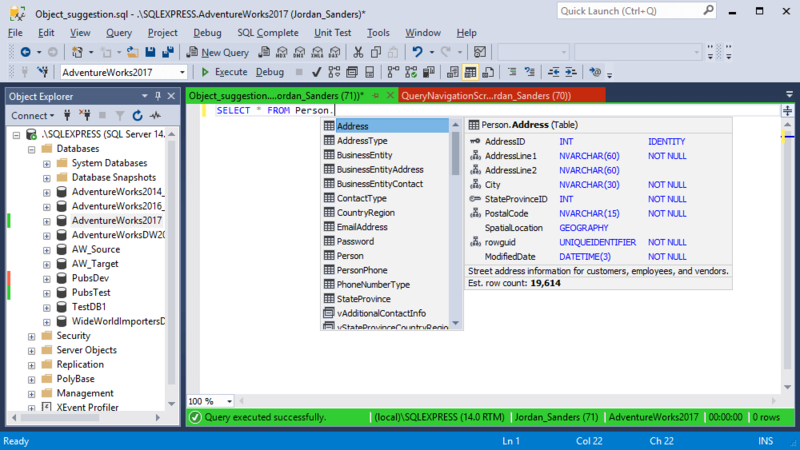 In the suggestion box, you can select multiple columns at once and they will be added to your SQL document. As you type the first letters of the column name, the list is filtered and those names that match the letters are shown on the top of the list. In addition to column names, you can see the data type of each column. One of the nice things with SQL Complete is that you can expand the asterisk symbol to the list of columns available in a table. INSERT, UPDATE, ALTER, and EXEC statements will be expanded to a full code template on pressing the Tab key, to avoid tedious typing. Along with the template, the type of column data will be generated in the comments along with the NOT NULL and ROWGUID properties. The feature allows you to see all identifier occurrences when you click one. Just as you place a mouse pointer over an identifier, all occurrences of the identifier in the code are highlighted at once. You won't get lost among multiple values to be inserted in columns, as SQL Complete will show which value corresponds to specific column you click in the INSERT statement. 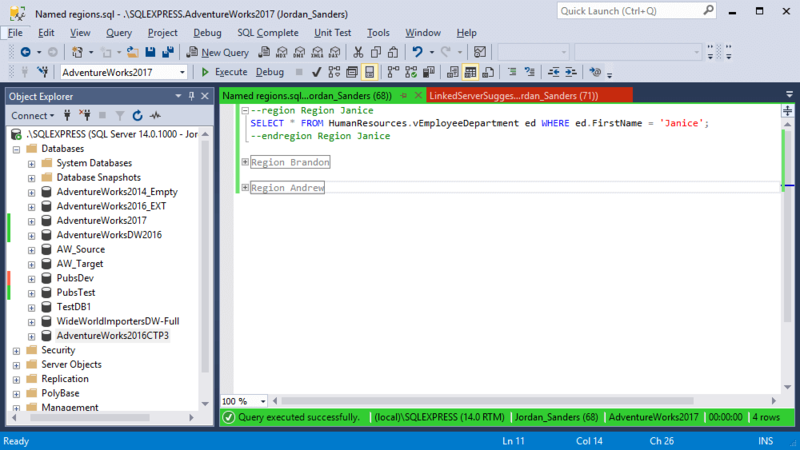 SQL Complete highlights both the opening and closing BEGIN/END code elements to visually define separate code blocks. This feature allows you to determine whether element pairs are properly paired and determine misspelled paired code elements. 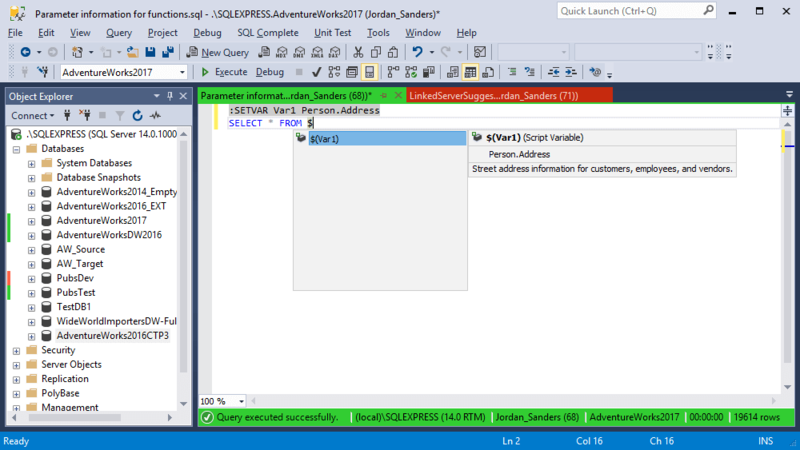 SQL Complete recognizes the following sets of delimiters: IF...ELSE, BEGIN...END, BEGIN TRY...END TRY, CASE...END, etc. This option adds the possibility to create named and unnamed regions, as well as reparse and refresh them automatically when opened in the editor. Expand/collapse buttons are added near a region head so you can wrap and unwrap regions. The feature greatly simplifies navigation in large SQL documents. You can see the structure of a current document in an easy-to-navigate Document Outline Window. The Synchronize Document Outline option in the shortcut menu allows you to synchronize document structure straight from the code. 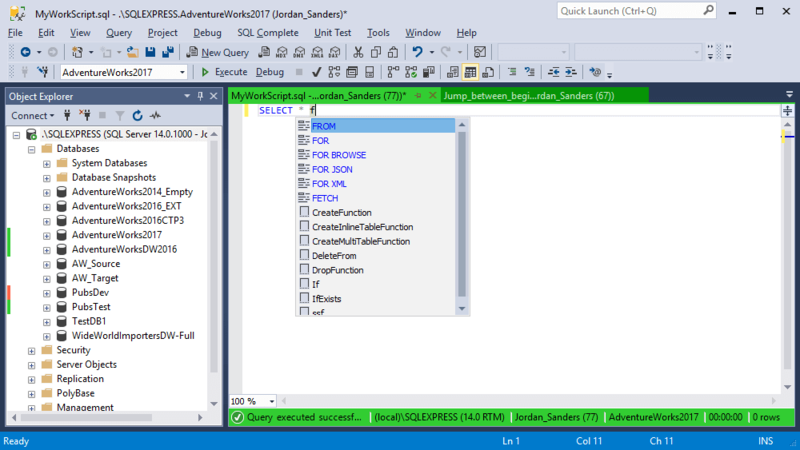 With the Go to definition option, you can quickly locate a needed object in the Object Explorer tree. 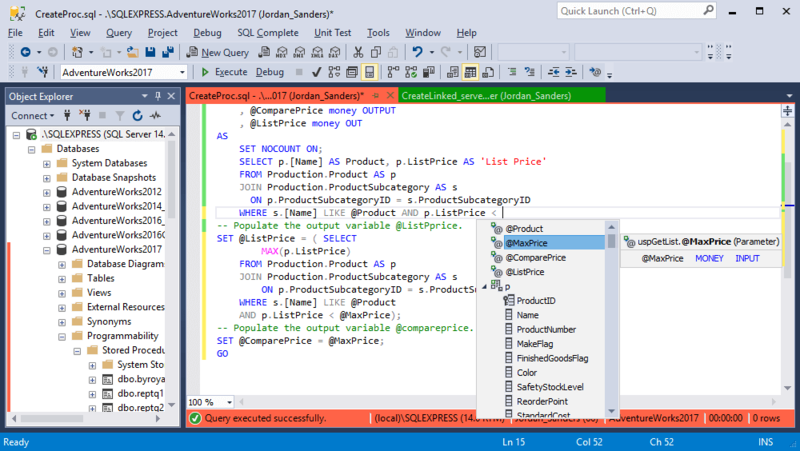 Document outline window allows navigating through the structure of the current SQL document which can be easily synchronized with the code. 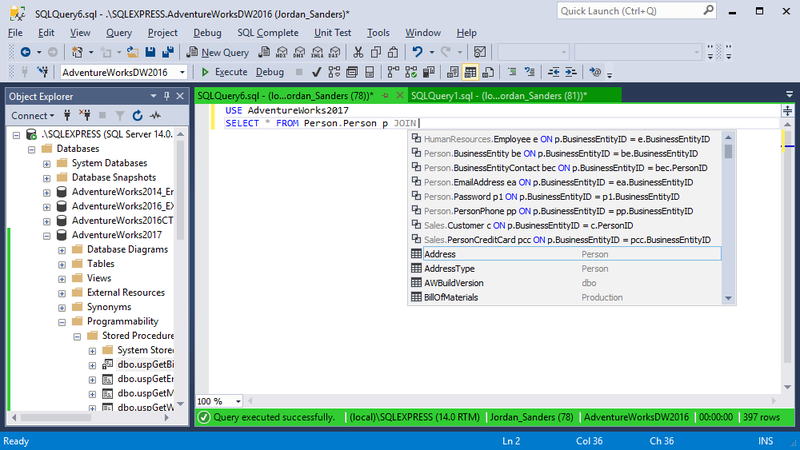 When you type call statements, information on stored procedures and function parameters is displayed. A hint gives you essential information on database objects while you are writing a code. For tables, you are prompted with column names, data types, additional column properties (e.g., not null and identify attributes), primary, unique, and foreign keys. For other objects, the quick info includes object type and an available user description. An estimated number of rows is shown at once when you hover over or click a certain table name. This may be helpful when estimating the effect of running a query. A SQL snippet is a frequently used code template which can be inserted into the code you are typing by pressing the Tab key. The feature makes recurrent use of code fragments more comfortable and simple. Snippets Manager provides a great number of default code templates to choose from. The default snippets can be modified as per your needs. Snippets Manager also allows you to create your own code snippets. This feature provides the ability to view and restore closed documents during the last session. This can be useful during intensive work with large amounts of used tabs. Suggestion list of ON conditions for JOIN joins. In the ON suggestion, the join options are selected by the primary key of the main table and the foreign key of the dependent table, as well as by the matching field names of the joined tables. The option allows displaying items in the list for ON suggestion in the reverse ratio. The functionality provides the ability to determine the order of the relationship of the elements for ON clause, depending on the script writing rules. 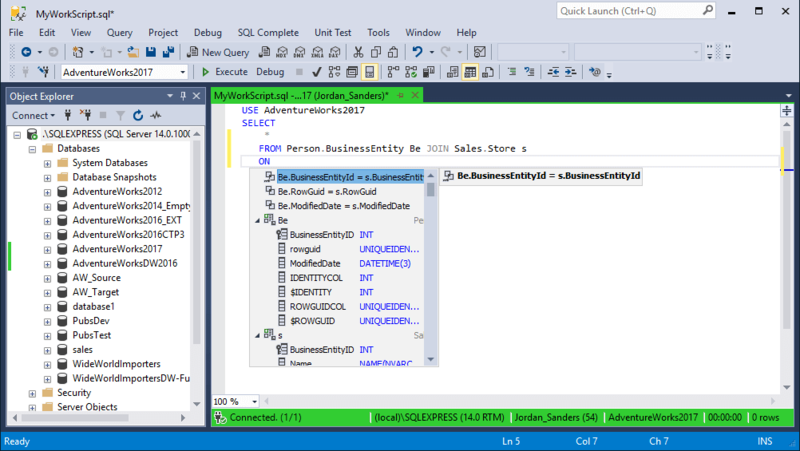 The functionality allows SQL Complete Intellisense disabling \ enabling at the user's request via using just one menu item. Note that formatting functions will be working after code completion disabling. This feature allows excluding items of user-defined databases from the suggestion list.